There have been many studies demonstrating that a portion of MHC class II molecules reside in detergent-insoluble membrane domains (commonly referred to as lipid rafts). We have proposed that the function of raft association is to concentrate specific MHC class II-peptide complexes in plasma membrane microdomains that can facilitate efficient T cell activation. We now show that MHC class II becomes lipid raft associated before binding antigenic peptides. Using pulse-chase radiolabeling techniques, we find that newly synthesized MHC class II and MHC class II-invariant chain complexes initially reside in a detergent-soluble membrane fraction and acquire detergent insolubility as they traffic to lysosomal Ag processing compartments. Monensin, an inhibitor of protein transport through the Golgi apparatus, blocks association of newly synthesized MHC class II with lipid rafts. Treatment of cells with leupeptin, which inhibits invariant chain degradation, leads to the accumulation of MHC class II in lipid rafts within the lysosome-like Ag-processing compartments. Raft fractionation of lysosomal membranes confirmed the presence of MHC class II in detergent-insoluble microdomains in Ag-processing compartments. These findings indicate that newly synthesized MHC class II complexes are directed to detergent-insoluble lipid raft microdomains before peptide loading, a process that may facilitate the loading of similar peptides on MHC class II complexes in these microdomains. Activation of CD4+ T cells requires engagement of the TCR with specific MHC class II-peptide complexes on the surface of an APC. Less than 500 MHC class II-peptide complexes are required for T cell activation, a number that can represent <0.1% of the total amount of class II on the APC surface (1, 2, 3). We are interested in understanding the mechanism that would allow a T cell to engage such a small number of specific class II-peptide complexes. One possible mechanism could be that these relevant class II-peptide complexes are not randomly distributed on the surface of APCs but are instead locally concentrated in small plasma membrane microdomains. Lipid rafts are membrane microdomains that have received considerable attention in recent years. These microdomains are characterized as having a high concentration of cholesterol and sphingolipids and are often enriched in GPI-anchored and other lipid-modified proteins. Although individual rafts are too small to visualize by light microscopy, rafts and raft components are often characterized by their biophysical property of exhibiting relative insolubility in nonionic detergents and can be isolated in discontinuous sucrose density gradients (4). As assessed by both detergent insolubility and immunofluorescence microscopy, there is considerable evidence that a significant proportion of MHC class II resides in these detergent-insoluble lipid raft membrane microdomains in a variety of APC subtypes, including B cells, macrophages, and activated dendritic cells (5, 6, 7, 8, 9, 10, 11, 12). Disruption of APC lipid rafts profoundly inhibits T cell activation by APCs only under conditions in which the number of Ag-specific complexes is limiting (13). This evidence has led us to propose that association with lipid rafts serves to increase the local surface density of MHC class II peptide complexes to facilitate TCR cross-linking and activation (11, 13). Because perturbing MHC class II association with lipid rafts can inhibit Ag presentation to T cells, it follows that under these conditions each “raft” must contain more than one class II molecule with any given peptide (i.e., each raft must contain at least two copies of identical class II-peptide complexes). However, how MHC class II containing identical peptides could come to reside in the same lipid raft microdomain is unclear. Our hypothesis is that it occurs by a mechanism that is intimately related to the cell biology of class II trafficking and antigenic peptide loading in APCs. Newly synthesized class II binds to a chaperone protein, termed the invariant chain (Ii)2 in the endoplasmic reticulum (ER), which escorts nascent MHC class II αβI complexes out of the ER, through the Golgi apparatus, and ultimately into lysosome-like Ag processing compartments (14). In these compartments, Ii is degraded by proteases and dissociates from MHC class II (15). Only a small CLIP remains associated with the peptide-binding groove of the MHC class II αβ dimer in this compartment (16, 17). The peptide editor HLA-DM, which also resides in these Ag-processing compartments, catalyzes the exchange of the class II-associated CLIP fragment with high affinity antigenic peptides that are generated by proteolysis of internalized foreign Ag (16, 17). Upon antigenic peptide loading the MHC class II-peptide complexes travel via vesicles and/or tubules from these peptide-loading compartments to the plasma membrane (14, 18, 19). In this study, we have examined at what point in the intracellular MHC class II trafficking pathway MHC class II first associates with lipid raft microdomains. We considered two distinct, testable possibilities: 1) that newly arriving MHC class II-peptide complexes are already raft-associated before delivery to the plasma membrane or 2) that MHC class II-peptide complexes associate with pre-existing lipid rafts only after arrival at the plasma membrane. Using pulse-chase biosynthetic labeling techniques, we find that the former of the two possibilities is correct and that newly synthesized MHC class II associates intracellularly with lipid rafts in a post-Golgi Ag-loading compartment. Additionally, we show that association of MHC class II with lipid rafts is not dependent upon class II binding to Ii, demonstrating that raft association of MHC class II is an intrinsic property of the MHC class II molecule itself and does not require Ii-dependent sorting of MHC class II molecules to intracellular Ag-processing compartments. Human JY B cells were maintained in RPMI 1640 containing 10% FBS, 10 mM glutamine, 10 mM HEPES, and 50 μg/ml gentamicin (complete RPMI) at 37°C. HeLa cells were maintained in DMEM containing 10% FBS, 10 mM HEPES, 10 mM glutamine, and 50 μg/ml gentamicin at 37°C. cDNA constructs used in this study were pcDNA-3 (Invitrogen Life Technologies, Carlsbad, CA), pcDNA3-human Ii-p33, and CDM8-HLA-DR3α, CDM8-HLA-DR3β (20). Subconfluent HeLa cells were transiently transfected using LipofectAmine Reagent (Invitrogen Life Technologies) according to manufacturer’s instructions and harvested for biochemical studies 24 h later. Abs to ICAM-1 and CD59 were purchased from Serotec (Raleigh, NC). mAb L243 and isotype control IgG Abs were purchased from BD Pharmingen (San Diego, CA). Anti-calnexin mAb was purchased from BD Transduction Laboratories (San Diego, CA). The mAbs to the HLA-DR-α-chain (DA6.147), HLA-DR β-chain (XD5.A11), and human Ii (Pin1.1) have been previously described (20). A rabbit antiserum recognizing the cytosolic domain of the HLA-DR β-chain was the generous gift of Dr. E. Long (National Institute of Allergy and Infectious Diseases, National Institutes of Health, Bethesda, MD). The control Ab, MOPC21, and protein A-Sepharose beads was purchased from Sigma-Aldrich (St. Louis, MO). The anti-Ii Ab, LL1, has been previously described (21). The anti-HLA-DM mAb K-76 was a kind gift of Dr. S. Pierce (National Institute of Allergy and Infectious Diseases, National Institutes of Health). [35S]Methionine was purchased from ICN Biosciences (Irvine, CA). Methyl-β-cyclodextrin (MCD) was purchased from Sigma-Aldrich. Endoglycosidase H (endo H) was purchased from New England Biolabs (Beverly, MA). Human JY B cells were harvested from culture (in log phase growth) and washed twice with methionine-free DMEM containing 3% dialyzed FBS, 10 mM HEPES, 50 μg/ml gentamicin, and 50 μM 2-ME. Cells (usually 75 × 106 cells per time point/condition) were resuspended at 10 × 106/ml and incubated in methionine-free medium at 37°C for 9 min. [35S]Methionine was added to a final concentration 1.5 mCi/75 × 106 cells and incubated with the cells at 37°C in a humidified CO2 atmosphere for various time points. The pulse radiolabeling was stopped by the addition of ice-cold media containing a 20-fold excess of unlabeled methionine and washed. Cells were then either immediately used for subsequent raft fractionations or chased in complete RPMI medium containing a 5-fold excess of unlabeled methionine at a concentration of 2 × 106/ml for various time points. In some experiments. monensin (100 nM; Sigma-Aldrich) or leupeptin (0.5 mg/ml; Sigma-Aldrich) were added during the chase. In some studies, either unlabeled or radiolabeled cells were treated with 10 mM MCD for 12 min before raft isolation as described previously (11). Isolation of membrane rafts was performed as described in Ref. 13 . Briefly, cells were lysed at a concentration of 108 cells/ml in MES-saline buffer (20 mM MES, 150 mM NaCl, pH 6.5) containing 1% Brij-58 and protease inhibitors (500 μM PMSF, 100 μM Nα-p-tosyl-l-lysine chloromethyl ketone (TLCK), 5 mM iodoacetamide, 10 μg/ml aprotinin, and 5 μg/ml leupeptin) for 1 h on ice. The lysate was mixed 1:1 with 90% sucrose in MES saline and placed at the bottom of an ultracentrifuge tube. The sample was overlaid with 6 ml of 30% sucrose and 4 ml of 5% sucrose in MES buffer and centrifuged at 100,000 × g in a SW41-Ti swinging bucket rotor at 4°C for 18 h. Fractions (1 ml) were gently removed from the top of the gradient and each sample was incubated with N-octylglucoside (1% final) at 4°C for 1 h to completely solubilize Brij-58 insoluble membrane fractions. Lysosomes from JY B cells were isolated by standard protocol as described (22). JY B cells (108) were washed twice in HBSS (Mg and Ca-free) and once in TEA/sucrose buffer (10 mM triethanolamine, 1 mM EDTA, 10 mM acetic acid, 250 mM sucrose, pH 7.4). Cells were then resuspended in ice-cold TEA/sucrose (∼35 × 106/ml) and passed through a ball-bearing homogenizer (0.01 cm clearance) on ice for eight passes (resulting in ∼80% cracked cells). The homogenate was subjected to centrifugation at 1300 × g for 10 min twice to remove intact cells, nuclei, and cell debris. Two milliliters of postnuclear supernatant was mixed with 9 ml of ice-cold TEA-buffered 27% Percoll (Amersham Biosciences, Piscataway, NJ) and placed into a 12-ml ultracentrifuge tube. A 0.6-ml cushion of TEA-buffered 27% Histodenz (Sigma-Aldrich) was underlaid beneath the Percoll and the sample was subjected to centrifugation at 17,000 rpm in a SW41Ti rotor for 1 h at 4°C. The low density membranes (2 ml) were visualized and collected from the top of the gradient and the high-density lysosomal membranes (0.6 ml) were visualized just above the Histodenz cushion and collected by needle puncture. Aliquots of each pool were saved for immunoblot analysis. The membranes from each pool were pelleted by centrifugation at 100,000 × g at 4°C, washed once in PBS, and the membrane pellets lysed in an equal volume of MES buffer containing 2% Brij-58 and protease inhibitors. Lipid raft isolation was conducted as described in the previous section. To detect radiolabeled proteins or protein complexes in membrane raft fractions, pools of raft and nonraft (soluble) fractions were subjected to immunoprecipitation. BSA (1 mg/ml final) was added to each pool to inhibit nonspecific protein adsorption to Sepharose beads. Protein A-Sepharose beads (Sigma-Aldrich) were precoupled to rabbit anti-mouse Ig serum (Sigma-Aldrich) and specific mouse mAbs were incubated with the beads for 1 h at 4°C. Beads were washed in Tris-saline buffer (10 mM Tris, 150 mM NaCl, pH 7.4) and once in immunoprecipitation buffer (1% Triton X-100, 1 mg/ml BSA in Tris saline containing protease inhibitors as described in raft isolation). Pooled fractions were precleared with beads coupled to the control mAb MOPC21 for 1 h at 4°C. Aliquots of precleared lysates were added to specific immunoprecipitation beads and the mixtures were incubated 2–4 h at 4°C on a rotator. Immunoprecipitates were extensively washed in immunoprecipitation buffer and the pellets were frozen at −80°C until analysis. Immunoprecipitates were analyzed by either one-dimensional SDS-PAGE or two-dimensional gel with nonequilibrium pH gradient electrophoresis (NEPHGE) in the first dimension followed SDS-PAGE in the second dimension (23). All radiolabeled gels were fixed in 20% methanol/10% acetic acid, and signals enhanced by treatment with Enlightening (ICN Biosciences) before drying and exposure. Aliquots of each immunoprecipitate were also analyzed by SDS-PAGE and immunoblotting. In some experiments, immunoprecipitates were split and treated with or without endo H for 1 h at 37°C as per the manufacturer’s instructions. To visualize proteins residing in membrane rafts, equal portions of each fraction or pooled fractions were analyzed by separation on 10.5% SDS-PAGE, transferring to Sequi-blot PVDF membranes (Bio-Rad, Hercules, CA) and immunoblotting with specific mAbs. Blots were analyzed by using primary Abs (either supernatants, purified Abs, or ascite fluid) as described in the figure legends. Blots were developed with HRP-conjugated anti-mouse IgG (1:2500) or anti-rabbit IgG (1:5000) (Southern Biotechnology Associates, Birmingham, AL) followed by ECL (PerkinElmer, Boston, MA). Quantitative analysis of protein expression in various samples was performed by laser densitometry of either immunoblots or autoradiograms using a Molecular Dynamics Densitometer and ImageQuant software (Sunnyvale, CA). Scans of multiple exposures were obtained to ensure that the results fell into the linear range of the instrument. Previously, we have reported that ∼15–20% of MHC class II molecules reside in lipid rafts as shown by TX-100 detergent insolubility (11). Subsequent studies have shown that anywhere from 2 to 50% of MHC class II is detergent insoluble as analyzed by sucrose density gradient centrifugation depending on the cell type examined, the ratio of cell protein-to-detergent, and detergent used for membrane protein solubilization (6, 8, 9, 10, 12, 24). Therefore, before investigating the kinetics of MHC class II association with detergent insoluble membrane microdomains, we sought to fully characterize the distribution of MHC class II and other integral membrane proteins in these raft microdomains isolated from EBV-transformed B cell lines lysed in the nonionic detergent Brij-58. Sucrose density gradient centrifugation revealed that both calnexin (an ER-resident protein) and ICAM-1 (a plasma membrane protein) were excluded from the low buoyant density raft fractions and were found in the soluble fractions of the gradient (98 and 100%, respectively) (Fig. 1⇓A). By contrast, CD59, a GPI-anchored protein, exclusively partitions with the detergent-insoluble raft fractions (Fig. 1⇓A). Approximately 65% of the total pool of membrane-associated MHC class II partitioned with the lipid raft fractions in these gradients (Fig. 1⇓, A and C). This behavior was cholesterol dependent, because perturbation of plasma membrane cholesterol using MCD before raft isolation reduced MHC class II association with lipid rafts by 85% (Fig. 1⇓, B and C). From these results, we conclude that the low buoyant density of MHC class II is not an artifact of incomplete membrane solubilization and is a cholesterol-dependent phenomenon. Detergent insolubility of MHC class II in Brij-58. JY B cells (50 × 106) were either mock-treated (A) or treated with 10 mM MCD (B) for 12 min. Following treatment, cells were washed in HBSS, lysed in 1% Brij-58, and analyzed by sucrose density gradient centrifugation as described in Materials and Methods. Equal portions of each fraction were analyzed by immunoblotting using Abs recognizing MHC class II α-chains (mAb DA6.147), CD59, ICAM-1, or calnexin. C, The percentage of the total fraction of each protein partitioning with the detergent-insoluble lipid raft fractions was determined by quantitative immunoblot analysis. The graph represents combined data from the total number of experiments indicated, were n is equal to the number of experiments for the particular data point. In our attempts to understand more completely the biological role of MHC class II association with detergent-insoluble lipid raft membrane microdomains, we set out to determine whether MHC class II molecules that have not yet bound antigenic peptides were raft-associated or if class II association with lipid rafts only occurred after peptide loading. To address this question, we “pulse” radiolabeled B cells with [35S]methionine for only 10 min and followed the fate of these labeled MHC class II molecules during different times of “chase” to determine whether raft association of newly synthesized MHC class II changed as the class II molecules trafficked through the cell. Very little newly synthesized MHC class II molecules were found in lipid rafts following the 10 min pulse (<2%, Fig. 2⇓A). After a 3-h chase, a time when some (but not all) MHC class II would have reached the cell surface (25), 45% of newly synthesized MHC class II had now associated with rafts (Fig. 2⇓, A and C). The absence of the high-mannose, unprocessed form of Ii-p33 in the MHC class II immunoprecipitate suggests that either raft-associated MHC class II is devoid of Ii or the immunoprecipitate contains MHC class II αβI complexes possessing mature, processed forms of Ii-p33 (indicated as Ii-p33p). By 16 h (a time point in which almost all labeled MHC class II is on the cell surface (25)) ∼60% of newly synthesized MHC class II is associated with lipid rafts (Fig. 2⇓A), a value that is essentially identical to that of the total pool of membrane-associated class II (as determined by Western blotting) (Fig. 2⇓B). The loss of [35S]methionine signal at the 16 h chase point is a consequence of the dissociation of the methionine-rich Ii from the MHC class II αβI complex. These studies demonstrate that MHC class II was initially present in a detergent soluble membrane domain and acquired detergent insolubility during intracellular transport. MHC class II traffics into rafts during biosynthesis. For each time point indicated, 75 × 106 JY B cells were pulsed with [35S]methionine for 10 min at 37°C. Aliquots of the incubation were then harvested immediately (Pulse) or chased in complete media containing excess nonradioactive methionine for either 3 h or for 16 h. Cells were harvested, lysed, and rafts were isolated as described in Materials and Methods. Following raft fractionation, raft (R) and nonraft soluble (S) fractions were pooled and subjected to immunoprecipitation using a mixture of MHC class II-specific mAbs (DA6.147 and XD5.A11). Immunoprecipitates were boiled and reduced in sample buffer containing 2-ME before loading. A, Immunoprecipitates were analyzed by SDS-PAGE and autoradiography to visualize newly synthesized [35S]methionine-labeled MHC class II. B, Aliquots of these same immunoprecipitates were analyzed by immunoblotting using a MHC class II α-chain specific mAb (DA6.147) to determine the total amount MHC class II present in each sample under steady state conditions. C, The percentage of class II molecules partitioning with lipid raft microdomains (as a fraction of the total amount of class II present in all gradient fractions) was determined by quantitative densitometry of either immunoblots (for total MHC class II) or autoradiograms (for [35S]methionine-labeled class II). The graph represents the results of four independent experiments. During transit from the ER to the plasma membrane, MHC class II αβI complexes traverse the Golgi apparatus and ultimately enter lysosome-like Ag processing compartments (14). In these compartments, Ii is proteolytically degraded, dissociates from the MHC class II αβ complex, and antigenic peptides load onto nascent MHC class II (14). We next examined whether newly synthesized, raft-associated MHC class II remains associated with Ii as αβI complexes, or if MHC class II only associates with lipid rafts after Ii dissociation. To determine the subunit composition of newly synthesized raft and nonraft MHC class II, we analyzed MHC class II immunoprecipitates from cells metabolically labeled and chased for either 3 h or 16 h by two-dimensional PAGE (NEPHGE followed by SDS-PAGE). 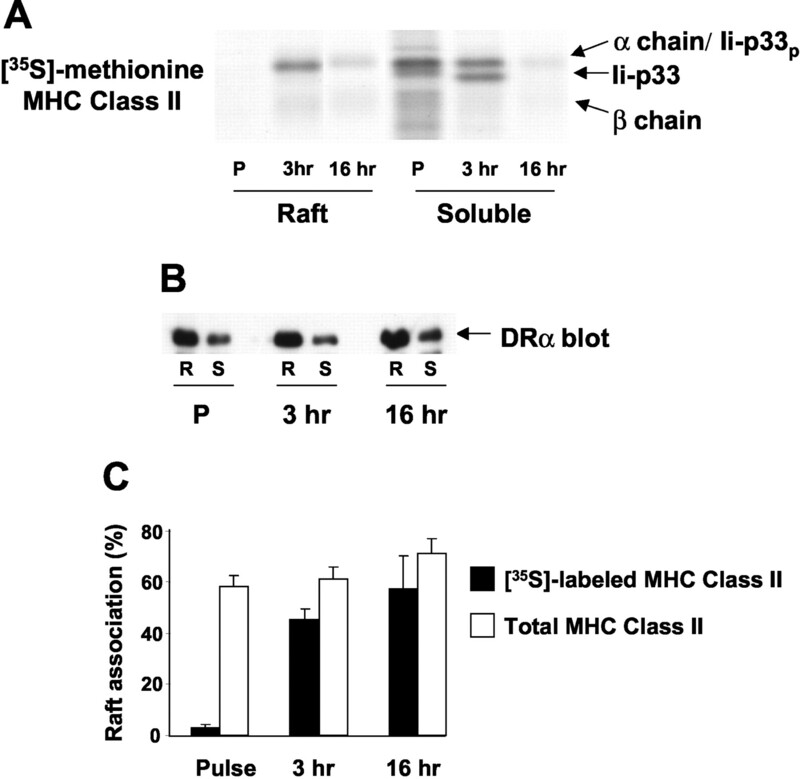 After 3 h of chase, [35S]methionine-labeled, raft-associated MHC class II molecules remained associated with Ii, revealing the presence of MHC class II αβI complexes in lipid rafts (Fig. 3⇓A). 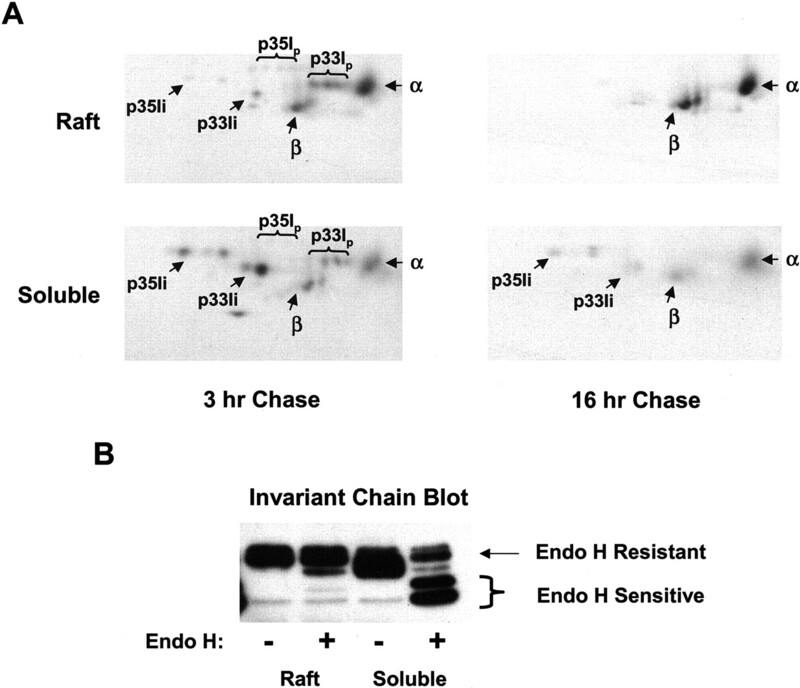 Two-dimensional PAGE demonstrated that the carbohydrate moieties on the raft-associated class II α-, β-, p33Ii-, and p35Ii chains were sialylated and fully mature, revealing that these protein complexes had entered the trans-cisternae of the Golgi apparatus (Fig. 3⇓A). Notice also the relatively low abundance of high-mannose (unprocessed) p33-Ii and p35-Ii in class II immunoprecipitates from the lipid raft fraction. By contrast, carbohydrate moieties present on MHC class II molecules in the detergent-soluble (nonraft) fraction were not fully sialylated and existed predominantly in their high-mannose glycoform, consistent with the location of these complexes in the ER and early Golgi compartments. After 16 h of chase essentially all Ii had dissociated from the newly synthesized MHC class II (25) and the subunits of the class II αβ dimer exist in their completely sialylated form (Fig. 3⇓A). Mature MHC class II-Ii complexes are present in rafts. A, Pulse-chase radiolabeling of JY B cells, cell lysis, and raft isolation were performed as described in Fig. 2⇑. MHC class II was immunoprecipitated from pools of the raft and the soluble (nonraft) fractions using MHC class II mAb-coupled beads. The beads were washed and then eluted in 8 M urea for 30 min at 37°C. The immunoprecipitates were subjected to two-dimensional PAGE and visualized by autoradiography. The arrows indicate the positions of the MHC class II α-chain, MHC class II β-chain, the high mannose forms of p33-Ii or p35-Ii, and the sialylated/processed form of p33-Ii (p33Ip) or p35-Ii (p35Ip). B, MHC class II was immunoprecipitated from pooled raft and soluble (nonraft) fractions using an anti-MHC class II β-chain rabbit serum and treated with or without endo H as described in Materials and Methods. The samples were analyzed by immunoblotting using an Ii-specific mAb (LL1). The mobility of endo H-resistant and endo H-sensitive Ii is indicated by arrows. The results are representative of three independent experiments. To further confirm that MHC class II αβI complexes in the soluble fraction were primarily present in the ER, we treated class II immunoprecipitates from pooled raft and soluble fractions with endo H. Endo H removes immature high mannose carbohydrates from newly formed proteins that have not traversed the medial-cisternae of the Golgi apparatus, where the carbohydrates are processed and become resistant to endo H digestion. Based on the two-dimensional PAGE analyses, we would expect Ii complexed with class II to be endo H-resistant in the raft fraction, but mostly endo H-sensitive in the soluble (nonraft) fraction. As expected, Ii bound to class II in the raft fraction is predominantly endo H-resistant, while in the soluble fraction it is predominantly endo H-sensitive (Fig. 3⇑B). Therefore, we conclude that MHC class II αβI complexes are detergent soluble early in the biosynthetic (secretory) pathway and begin to acquire detergent insolubility after transport through the Golgi apparatus. To further define the stage in which MHC class II begins to accumulate in lipid rafts we treated cells with either monensin or leupeptin, well-characterized inhibitors of MHC class II trafficking (15, 23, 26, 27). Monensin is an ionophore that inhibits protein transport from the medial- to trans-cisternae of the Golgi apparatus, prevents terminal glycosylation of MHC class II-associated Ii, and results in an accumulation of MHC class II αβI complexes in the medial-Golgi apparatus (23). By contrast, leupeptin is a protease inhibitor that prevents complete Ii proteolysis, and as a consequence class II molecules are retained in lysosome-like Ag-processing compartments (15, 26, 27). Furthermore, incomplete Ii proteolysis generates a 21-kDa leupeptin-induced polypeptide (LIP) fragment of Ii that remains associated with class II and contains a lysosomal-retaining motif, and for this reason class II αβ-LIP complexes reveal peptide-free MHC class II that resides in internal Ag-processing compartments (15). Using these inhibitors we can therefore examine the detergent insolubility of MHC class II “trapped” at various points in the biosynthetic pathway. To restrict our analysis to newly synthesized MHC class II, we once again used a pulse-chase approach. B cells were metabolically labeled with [35S]methionine and chased in the absence or presence of either monensin or leupeptin for 3 h before raft isolation. Once again, very little newly synthesized MHC class II was present in lipid rafts after the initial 10 min pulse labeling, but after 3 h ∼50% of newly synthesized MHC class II had acquired detergent insolubility (Fig. 4⇓A). Treatment with monensin almost completely prevented newly synthesized MHC class II from acquiring detergent insolubility (Fig. 4⇓A). It should be noted that this short 3-h treatment had very little effect on the distribution of the entire pool of cell-associated class II (Fig. 4⇓, B and C). MHC class II associates with lipid rafts in late Golgi/lysosomal compartments. Following a 10-min pulse radiolabeling with [35S]methionine, JY B cells were washed and chased for 3 h in complete medium alone (no treatment, NT), medium containing monensin (Mon), or medium containing leupeptin (Leu). As a control, a sample of the 10-min pulse radiolabeled sample (P) was included. Following lipid raft fractionation, raft (R) and soluble/nonraft (S) fractions were pooled and were subjected to immunoprecipitation by MHC class II mAb beads (DA6.147 and XD5.All). A, The immunoprecipitates were analyzed by SDS-PAGE and autoradiography to visualize radiolabeled MHC class II molecules. B, Aliquots of these same immunoprecipitates were analyzed by immunoblotting using the anti-MHC class II α-chain-specific mAb (DA6.147) to determine the total amount of MHC class II present in each sample under steady state conditions. C, The percentage of class II molecules partitioning with lipid raft microdomains under each condition (as a fraction of the total amount of class II present in all gradient fractions) was determined by quantitative densitometry of either immunoblots (for total MHC class II) or autoradiograms (for [35S]methionine-labeled class II). The graph represents the results of three independent experiments. Unlike monensin, treatment with leupeptin did not inhibit MHC class II association with lipid rafts (Fig. 4⇑A). The inclusion of leupeptin during the 3-h chase resulted in the appearance of the Ii breakdown product LIP associated with MHC class II, confirming the presence of these complexes in lysosome-like Ag-processing compartments (Fig. 4⇑A). Because class II-LIP complexes are not capable of binding antigenic peptides (28), these data demonstrate that MHC class II acquires detergent insolubility before binding antigenic peptides. To further determine whether MHC class II was associated with lipid rafts in intracellular Ag-loading compartments, we isolated these compartments by subcellular fractionation on 27% Percoll gradients. The purity of the low-density membranes (which includes plasma membrane) and the high-density lysosome fraction was confirmed by immunoblotting. Analysis of each fraction for MHC class II and HLA-DM (a lysosomal resident protein) revealed that our lysosomal fraction contained >90% of HLA-DM but <2% of the total class II (Fig. 5⇓A). The pooled membrane fractions were then solubilized in Brij-58 and subjected to raft fractionation on sucrose density gradients. 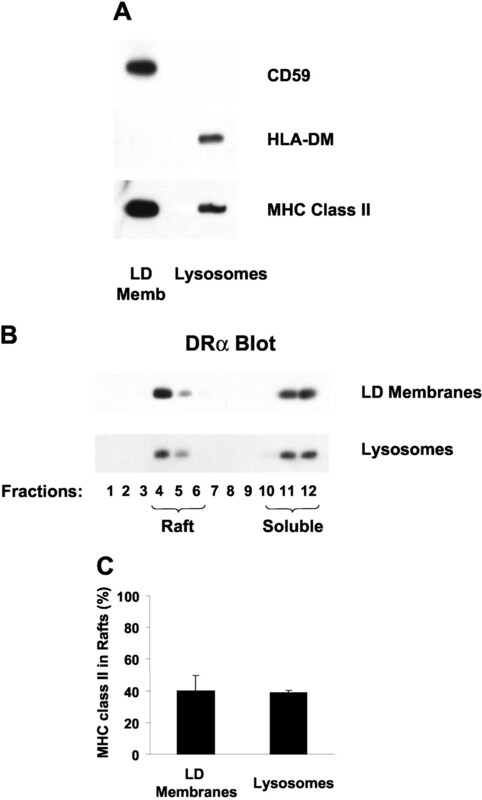 Approximately 42% of MHC class II was associated with lipid rafts when purified lysosomal membranes were analyzed on these sucrose gradients (Fig. 5⇓, B and C). This is virtually identical to the amount of MHC class II associated with lipid rafts in the low density membrane fraction (Fig. 5⇓, B and C). (The difference between this value and that obtained using intact cells is likely due to different membrane-detergent ratios used in each procedure.) Therefore, MHC class II is present in detergent-insoluble raft microdomains in the Ag-loading compartments. Taken together these studies show that raft acquisition of MHC class II occurs in a postmedial Golgi compartment (by the time the molecules reach the lysosomes) and also that association of MHC class II with lipid rafts occurs before cell surface arrival of MHC class II-peptide complexes. 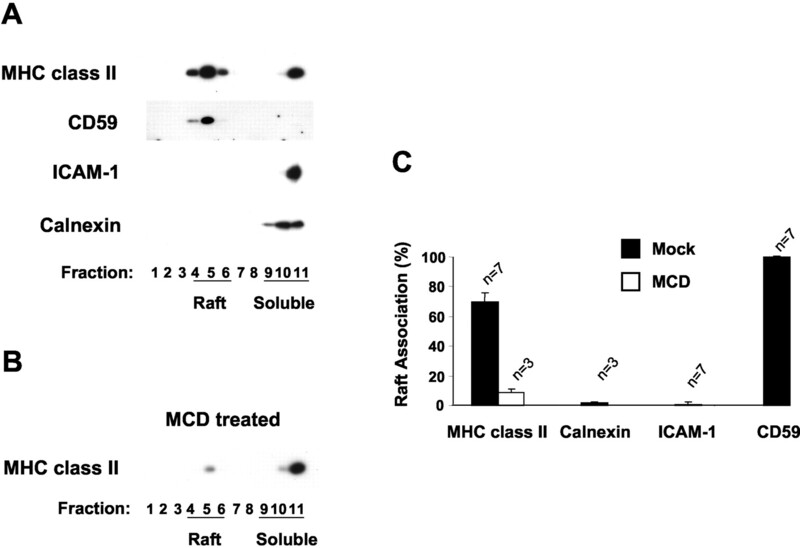 MHC class II is raft associated in isolated Ag-processing compartments. JY B cells were broken, internal compartments isolated using 27% Percoll gradients, and low density (LD) and high density lysosomal membranes were isolated as described in the Materials and Methods. A, Equal volumes of each pooled fraction were analyzed by immunoblotting using Abs recognizing MHC class II α-chain (DA6.147), HLA-DM (K-76), and CD59. B, Purified low density membrane and the high density lysosomal membrane pools were solubilized in Brij-58 and lipid rafts were isolated by fractionation on sucrose density gradients. Equivalent portions of each fraction were subjected to immunoblot analysis for MHC class II (DA6.147). C, The percentage of class II molecules partitioning with lipid raft microdomains under each condition (as a fraction of the total amount of class II present in all gradient fractions) was determined by quantitative densitometry of immunoblots. The graph represents the results of three independent experiments. Another way to examine whether MHC class II acquires detergent insolubility before peptide loading is to determine the behavior of MHC class II-CLIP complexes. CLIP is normally removed from nascent MHC class II molecules by the action of the peptide editor HLA-DM in lysosome-like Ag-processing compartments (29, 30) and the presence of MHC class II-CLIP complexes is therefore indicative of MHC class II that has not yet bound high affinity antigenic peptides. Pooled raft and nonraft (soluble) fractions from B cells were subjected to immunoprecipitation using Abs recognizing all HLA-DR-α chains (mAb DA6.147), the mature MHC class II αβ heterodimer (mAb L243), or CLIP (mAb Cer.CLIP). When these immunoprecipitates were examined for MHC class II content (by immunoblotting for the MHC class II α-chain), we found no significant difference between the relative amount of each type of MHC class II molecules in lipid rafts (Fig. 6⇓). This is additional evidence that MHC class II molecules acquire detergent insolubility before binding high affinity antigenic peptides. MHC class II-CLIP complexes reside in lipid rafts. JY B cells were lysed in Brij-58 and fractionated by sucrose density centrifugation as described in Materials and Methods. A, Pools of raft (R) and soluble (S) fractions from JY gradients were subjected to immunoprecipitation using an isotype control Ab (MOPC21), an Ab to detect all forms of HLA-DR α (DA6.147), an Ab that predominantly recognizes class II αβ dimers (L243), or an Ab that specifically recognizes Ii-derived CLIP fragment (CerCLIP). The immunoprecipitates were analyzed for MHC class II content by immunoblotting with the anti-α-chain mAb DA6.147. B, These graphs represent the percentage of MHC class II partitioning in the lipid raft fractions as compared with the total amount of MHC class II present in the raft and nonraft pools. Immunoblots were quantitated by laser densitometry and the SD is the result of the combination of multiple exposures of identical blots. Our earlier radiolabeling experiments revealed the presence of MHC class II αβI complexes in lipid rafts (Fig. 3⇑). Therefore, we examined whether expression of Ii was required for initial MHC class II raft association. To address this question, we isolated lipid rafts from HeLa cells expressing MHC class II α- and β-chains in the presence or absence of Ii and analyzed the raft association of MHC class II from each cell type. 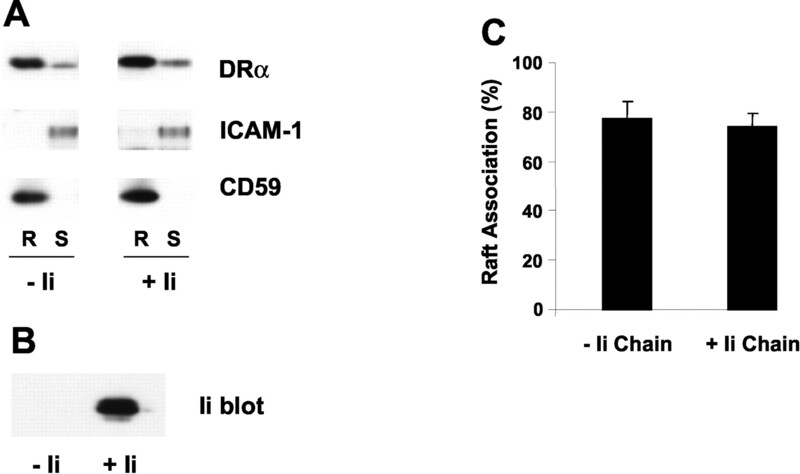 As expected, the control proteins CD59 and ICAM-1 resided in raft and nonraft (soluble) fractions, respectively (Fig. 7⇓A). The expression of Ii (Fig. 7⇓B) did not significantly change the distribution of MHC class II with detergent insoluble raft microdomains (Fig. 7⇓, A and C). This data demonstrates that the Ii-dependent sorting of MHC class II to Ag-processing compartments is not strictly required for the association of MHC class II with detergent-insoluble membrane microdomains. 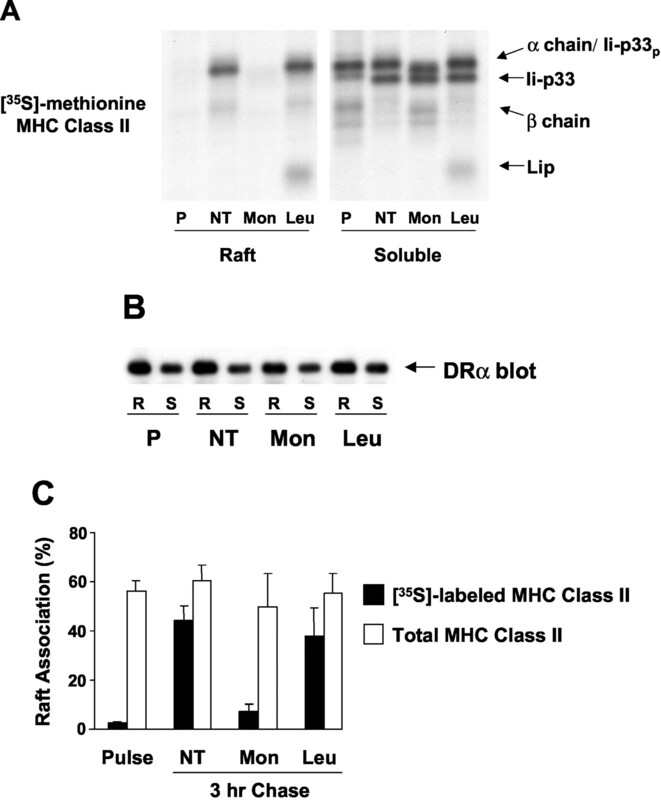 Expression of Ii does not affect association of MHC class II with lipid rafts. HeLa cells were transiently transfected with HLA-DR-α and HLA-DR-β cDNAs in the absence or presence of Ii-p33 cDNA. One day after transfection, cells were harvested and lysed in 1% Brij-58 and the extract was fractionated by sucrose density gradient centrifugation. A, Pooled raft (R) and soluble/nonraft (S) fractions were probed for MHC class II α-chain using mAb DA6.147 and each fraction was also probed with Abs recognizing ICAM-1 or CD59. B, Lysates from each transfectant were probed for expression Ii using mAb LL1. C, The percentage of class II molecules partitioning with lipid raft microdomains from cells expressing class II in the absence or the presence of Ii (as a fraction of the total amount of class II present in all gradient fractions) was determined by quantitative densitometry of immunoblots. The graph represents the results of three independent experiments. In this study, we investigated at which point during the biosynthetic pathway MHC class II enters detergent-insoluble lipid raft microdomains, and whether this event preceded loading of class II with antigenic peptides. We found that upon synthesis, MHC class II αβI complexes were present in detergent-soluble membranes and over time chased into detergent-insoluble lipid raft membranes, while the distribution of the total unlabeled pool of class II in rafts remained stable. This demonstrates that newly synthesized MHC class II is not initially present in lipid rafts. This pattern of movement into detergent-insoluble membranes or lipid rafts following initial synthesis is reminiscent of findings described for another raft resident protein, placental-like alkaline phosphatase, which acquires detergent insolubility and moves into lipid rafts during transport through the Golgi apparatus (31). This is consistent with our findings by two-dimensional PAGE analysis and endo H treatment that MHC class II αβI complexes containing Golgi-processed carbohydrates are enriched in detergent-insoluble lipid rafts, while the carbohydrates on the majority of detergent-soluble (nonraft) αβI complexes have not been processed. Furthermore, addition of monensin, which blocks transport of MHC class II from the medial to trans-Golgi (23), almost completely prevented the acquisition of MHC class II detergent insolubility. Taken together, this data supports the idea that MHC class II must traffic through the medial-Golgi to become raft associated. Although biochemical isolation of rafts using the criteria of detergent insolubility may not completely reflect the true nature of lipid rafts on living cells, our pulse-chase data clearly demonstrate that the observed insolubility of MHC class II is not a detergent-induced artifact. Detergent insolubility of newly synthesized MHC class II molecules was observed only after these proteins traversed the medial-Golgi even in cells in which the partitioning of the total pool of class II molecules was unchanged, highlighting this critical point. Therefore, it is important to emphasize that this phenomenon of detergent insolubility requires the trafficking of MHC class II molecules into distinct compartments in the APC. Three pieces of evidence support the idea that detergent insolubility or raft association of MHC class II occurs before peptide loading. First, we found MHC class II αβI complexes in lipid rafts, although the majority of these αβI complexes did possess late Golgi-processed carbohydrates. This points to raft association before Ii dissociation in Ag-loading compartments. Second, MHC class II-CLIP complexes were present in lipid rafts, demonstrating that even MHC class II that had not yet been “edited” by HLA-DM in peptide-loading compartments were present in lipid rafts. Finally, treatment with leupeptin, which inhibits export of MHC class II molecules to the cell surface, revealed the accumulation of MHC class II-LIP complexes in lysosome-like Ag-processing compartments that remained detergent insoluble. In addition, analysis of the purified Ag-processing compartments themselves revealed the presence of MHC class II in detergent-insoluble lipid rafts, excluding the possibility that drug treatment induced raft association in these compartments. Furthermore, the lysosomal compartments in B lymphocytes are highly enriched in cholesterol (32). Therefore, we propose that MHC class II is already detergent insoluble in lysosomal Ag-processing compartments, although the initial membrane in which class II αβI complexes associate with rafts, whether it be in late Golgi compartments (33) or the plasma membrane before internalization of nascent class II αβI complexes (20, 25), remains to be determined. Although we show that MHC class II resides in lipid rafts before and after peptide loading, due to the dynamic nature of lipid rafts it is difficult to unambiguously conclude that the peptide-loading event occurs in these microdomains. Although this study provides direct evidence that MHC class II molecules are trafficked into lipid rafts before peptide loading, there have been some indications that internally loaded MHC class II molecules are concentrated in lipid rafts. Machy et al. (6) showed that dendritic cells loaded with HEL protein, but not preprocessed HEL peptide, could cross-prime CD8+ T cells, and this process was sensitive to treatment of DCs with raft-disrupting agents. The same group has also reported that internally loaded Ag can skew naive CD4+ T cells to a Th1 phenotype, and raft disruption of these cells leads to a shift toward a Th2 phenotype (19). Surprisingly, the Th2 phenotype was also observed if the DCs were loaded on the plasma membrane with preprocessed antigenic peptides, suggesting that peptide loading onto intracellular class II molecules generates a cohort of cell surface MHC class II-peptide complexes whose function is lipid raft dependent. In addition to regulating T cell differentiation, there are data suggesting the mechanisms of Ag loading in APCs affects APC biology. Upon DC engagement with a T cell, MHC class II polarizes toward the immune synapse along thin, lysosomally derived tubules (19, 34). Bertho et al. (34) recently found that these tubules polarized to the T cell only when the DC processed and internally degraded Ag, as this was not observed when the DCs were loaded with preprocessed antigenic peptides. Although these studies have their caveats regarding the absolute numbers of MHC class II-peptide complexes formed under these different conditions and the role of endocytosis in regulating DC function, they strongly suggest that the mechanism of antigenic peptide loading (and therefore the effective concentration of specific MHC class II-peptide complexes is rafts) may affect the quality of the signal delivered to the T cell by the APC (affecting T cell polarization) as well as the quality of a signal delivered to the DC from the T cell (affecting DC lysosome tubulation). We propose that internal loading of MHC class II enriches specific MHC class II-peptide complexes in small numbers of distinct detergent-insoluble membrane microdomains, while surface loading by preprocessed peptides does not concentrate specific class II-peptide complexes in the same microdomains (i.e., they are more disperse). This leads us to the simple question: what makes MHC class II associate with lipid rafts? In the data presented here, we find that Ii expression does not influence MHC class II raft association (Fig. 6⇑). Additionally, we have previously shown that >50% of surface MHC class II is associated with lipid rafts (11). This is in marked contrast to a recent study showing that expression of Ii in tumor cell lines inhibits the association of surface MHC class II with lipid rafts (35). Other than citing cell type differences or experimental protocol, we have no explanation for the discrepancy between our data and that of Dolan et al. (35). Biophysical studies have lead investigators to propose that individual rafts could contain as many as 60 protein molecules (36) and a recent study suggests that each raft could contain as few as three protein molecules (37). Given such data, it is difficult to envision how a significant concentration of ligands, such as specific MHC class II-peptide complexes, could occur in large enough density to activate a T cell. Nevertheless, disruption of these lipid rafts does indeed abrogate activation of T cells by APCs, even if these APCs are formaldehyde fixed after raft disruption (11). One could argue that while only a very small percentage of surface MHC class II molecules contain the correct peptide for T cell recognition, given enough time the T cell could “scan” the APC for enough MHC class II-peptide complexes that are passively diffusing on the APC plasma membrane to become fully activated. However, it is unlikely that large numbers of class II molecules could diffuse to the T cell:APC contact site given the small amount of time an APC and T cell are engaged in vivo before TCR cross-linking (38). Additionally, the requirement for TCR cross-linking to generate the initial “stop” signal for the T cell (39) would be more likely to occur if the specific MHC class II complexes were preclustered. The data we present here shows the presence of MHC class II preclustered in lipid raft microdomains before peptide loading, thereby facilitating the loading of specific peptides on the MHC class II within an individual raft. It is interesting to speculate that the importance of membrane microdomains in clustering a few specific MHC class II-peptide complexes may be critical at this early time, when it would facilitate the initial cross-linking of the TCR. This engagement could then trigger a signal for the T cell to stop and allow itself to rearrange its cytoskeleton (and membrane organization), thereby allowing time for the T cell to “scan” for enough specific MHC class II-peptide complexes to become fully activated. We thank Drs. Pierre Henkart, David Segal, and the members of the Roche laboratory for helpful advice and critical reading of this manuscript. We also thank Dr. Sue Pierce and Eric Long for gifts of Abs. ↵2 Abbreviations used in this paper: Ii, invariant chain; ER, endoplasmic reticulum; MCD, methyl-β-cyclodextrin; endo H, endoglycosidase H; NEPHGE, nonequilibrium pH gradient electrophoresis; LIP, leupeptin-induced polypeptide. Harding, C. V., E. R. Unanue. 1990. Quantitation of antigen-presenting cell MHC class II/peptide complexes necessary for T-cell stimulation. Nature 346:574. Demotz, S., H. M. Grey, A. Sette. 1990. The minimal number of class II MHC-antigen complexes needed for T cell activation. Science 249:1028. Reay, P. A., K. Matsui, K. Haase, C. Wulfing, Y. H. Chien, M. M. Davis. 2000. Determination of the relationship between T cell responsiveness and the number of MHC-peptide complexes using specific monoclonal antibodies. J. Immunol. 164:5626. Edidin, M.. 2003. The state of lipid rafts: from model membranes to cells. Annu. Rev. Biophys. Biomol. Struct. 32:257. Setterblad, N., S. Becart, D. Charron, N. Mooney. 2001. Signalling via MHC class II molecules modifies the composition of GEMs in APC. Scand. J. Immunol. 54:87. Machy, P., K. Serre, M. Baillet, L. Leserman. 2002. Induction of MHC class I presentation of exogenous antigen by dendritic cells is controlled by CD4+ T cells engaging class II molecules in cholesterol-rich domains. J. Immunol. 168:1172. Huby, R. D., R. J. Dearman, I. Kimber. 1999. Intracellular phosphotyrosine induction by major histocompatibility complex class II requires co-aggregation with membrane rafts. J. Biol. Chem. 274:22591. Goebel, J., K. Forrest, D. Flynn, R. Rao, T. L. Roszman. 2002. Lipid rafts, major histocompatibility complex molecules, and immune regulation. Hum. Immunol. 63:813. Buatois, V., M. Baillet, S. Becart, N. Mooney, L. Leserman, P. Machy. 2003. MHC class II-peptide complexes in dendritic cell lipid microdomains initiate the CD4 Th1 phenotype. J. Immunol. 171:5812. Bouillon, M., Y. El Fakhry, J. Girouard, H. Khalil, J. Thibodeau, W. Mourad. 2003. Lipid raft-dependent and -independent signaling through HLA-DR molecules. J. Biol. Chem. 278:7099. Anderson, H. A., E. M. Hiltbold, P. A. Roche. 2000. 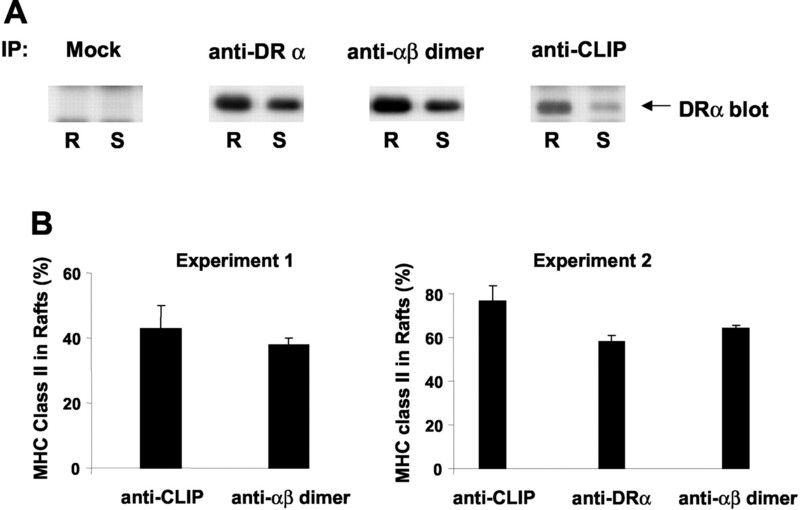 Concentration of MHC class II molecules in lipid rafts facilitates antigen presentation. Nat. Immunol. 1:156. Becart, S., N. Setterblad, S. Ostrand-Rosenberg, S. J. Ono, D. Charron, N. Mooney. 2003. Intracytoplasmic domains of MHC class II molecules are essential for lipid-raft-dependent signaling. J. Cell Sci. 116:2565. Hiltbold, E. M., N. J. Poloso, P. A. Roche. 2003. MHC class II-peptide complexes and APC lipid rafts accumulate at the immunological synapse. J. Immunol. 170:1329. Hiltbold, E. M., P. A. Roche. 2002. Trafficking of MHC class II molecules in the late secretory pathway. Curr. Opin. Immunol. 14:30. Blum, J. S., P. Cresswell. 1988. Role for intracellular proteases in the processing and transport of class II HLA antigens. Proc. Natl. Acad. Sci. USA 85:3975. Jensen, P. E., D. A. Weber, W. P. Thayer, L. E. Westerman, C. T. Dao. 1999. Peptide exchange in MHC molecules. Immunol. Rev. 172:229. Busch, R., R. C. Doebele, N. S. Patil, A. Pashine, E. D. Mellins. 2000. Accessory molecules for MHC class II peptide loading. Curr. Opin. Immunol. 12:99. Chow, A., D. Toomre, W. Garrett, I. Mellman. 2002. Dendritic cell maturation triggers retrograde MHC class II transport from lysosomes to the plasma membrane. Nature 418:988. Boes, M., J. Cerny, R. Massol, M. Op den Brouw, T. Kirchhausen, J. Chen, H. L. Ploegh. 2002. T-cell engagement of dendritic cells rapidly rearranges MHC class II transport. Nature 418:983. Roche, P. A., C. L. Teletski, E. Stang, O. Bakke, E. O. Long. 1993. Cell surface HLA-DR-invariant chain complexes are targeted to endosomes by rapid internalization. Proc. Natl. Acad. Sci. USA 90:8581. Anderson, H. A., P. A. Roche. 1998. Phosphorylation regulates the delivery of MHC class II invariant chain complexes to antigen processing compartments. J. Immunol. 160:4850. Pierre, P., L. K. Denzin, C. Hammond, J. R. Drake, S. Amigorena, P. Cresswell, I. Mellman. 1996. HLA-DM is localized to conventional and unconventional MHC class II-containing endocytic compartments. Immunity 4:229. Machamer, C. E., P. Cresswell. 1984. Monensin prevents terminal glycosylation of the N- and O-linked oligosaccharides of the HLA-DR-associated invariant chain and inhibits its dissociation from the α-β chain complex. Proc. Natl. Acad. Sci. USA 81:1287. Setterblad, N., C. Roucard, C. Bocaccio, J. P. Abastado, D. Charron, N. Mooney. 2003. Composition of MHC class II-enriched lipid microdomains is modified during maturation of primary dendritic cells. J. Leukocyte Biol. 74:40. Warmerdam, P. A., E. O. Long, P. A. Roche. 1996. Isoforms of the invariant chain regulate transport of MHC class II molecules to antigen processing compartments. J. Cell Biol. 133:281. Neefjes, J. J., H. L. Ploegh. 1992. Inhibition of endosomal proteolytic activity by leupeptin blocks surface expression of MHC class II molecules and their conversion to SDS resistance αβ heterodimers in endosomes. EMBO J. 11:411. Loss, G. E., Jr, A. J. Sant. 1993. Invariant chain retains MHC class II molecules in the endocytic pathway. J. Immunol. 150:3187. Jensen, P. E., D. A. Weber, W. P. Thayer, X. Chen, C. T. Dao. 1999. HLA-DM and the MHC class II antigen presentation pathway. Immunol. Res. 20:195. Kropshofer, H., G. J. Hammerling, A. B. Vogt. 1999. The impact of the non-classical MHC proteins HLA-DM and HLA-DO on loading of MHC class II molecules. Immunol. Rev. 172:267. Brown, D. A., J. K. Rose. 1992. Sorting of GPI-anchored proteins to glycolipid-enriched membrane subdomains during transport to the apical cell surface. Cell 68:533. Mobius, W., Y. Ohno-Iwashita, E. G. van Donselaar, V. M. Oorschot, Y. Shimada, T. Fujimoto, H. F. Heijnen, H. J. Geuze, J. W. Slot. 2002. Immunoelectron microscopic localization of cholesterol using biotinylated and non-cytolytic perfringolysin O. J. Histochem. Cytochem. 50:43. Benaroch, P., M. Yilla, G. Raposo, K. Ito, K. Miwa, H. J. Geuze, H. L. Ploegh. 1995. How MHC class II molecules reach the endocytic pathway. EMBO J. 14:37. Bertho, N., J. Cerny, Y. M. Kim, E. Fiebiger, H. Ploegh, M. Boes. 2003. Requirements for T cell-polarized tubulation of class II+ compartments in dendritic cells. J. Immunol. 171:5689. Dolan, B. P., T. P. Phelan, D. Ilkovitch, L. Qi, W. F. Wade, T. M. Laufer, S. Ostrand-Rosenberg. 2004. Invariant chain and the MHC class II cytoplasmic domains regulate localization of MHC class II molecules to lipid rafts in tumor cell-based vaccines. J. Immunol. 172:907. Pralle, A., P. Keller, E. L. Florin, K. Simons, J. K. Horber. 2000. Sphingolipid-cholesterol rafts diffuse as small entities in the plasma membrane of mammalian cells. J. Cell Biol. 148:997. Sharma, P., R. Varma, R. C. Sarasij, Ira, K. Gousset, G. Krishnamoorthy, M. Rao, S. Mayor. 2004. Nanoscale organization of multiple GPI-anchored proteins in living cell membranes. Cell 116:577. Bousso, P., E. Robey. 2003. Dynamics of CD8+ T cell priming by dendritic cells in intact lymph nodes. Nat. Immunol. 4:579. Dustin, M. L., S. K. Bromley, Z. Kan, D. A. Peterson, E. R. Unanue. 1997. Antigen receptor engagement delivers a stop signal to migrating T lymphocytes. Proc. Natl. Acad. Sci. USA 94:3909.